Chocolate is one of our favorite foods, whether in a recipe or a bar or box of chocolates snuggled in front of the TV. Working with chocolate is easier than you think by following a few tips before you start. Chocolate comes from the beans of the cocoa tree that are harvested and left to ferment before being dried and processed. It is the fermenting that develops the flavor and the quality of the chocolate; a fully fermented bean produces the finest quality chocolate. After drying the beans, they are then are roasted and undergo treatments to produce the cocoa solids and it these solids that are the basic ingredient of all chocolate products. Before choosing a chocolate to work with check the percentage of cocoa solids. The higher the percentage of solids the purer the chocolate. Plain Chocolate contains as much as 80% cocoa solids, is less sweet with an intense chocolate flavor. 60-70% solids are slightly sweeter with a dense chocolate flavor—a good chocolate for recipes. White Chocolate does not have cocoa solids but is made with cocoa butter—the fat extracted from the beans while processing instead. The best way to melt chocolate is on the hob in either a double boiler or a glass bowl over a pan of simmering water. Though this way is lengthier than melting in the microwave, you will have more control over the melting process and less risk of burning. Break the chocolate into small pieces and place in a bowl or top of the boiler. Do not let the bottom of the bowl touch the water or let ​the water come into contact with the chocolate. 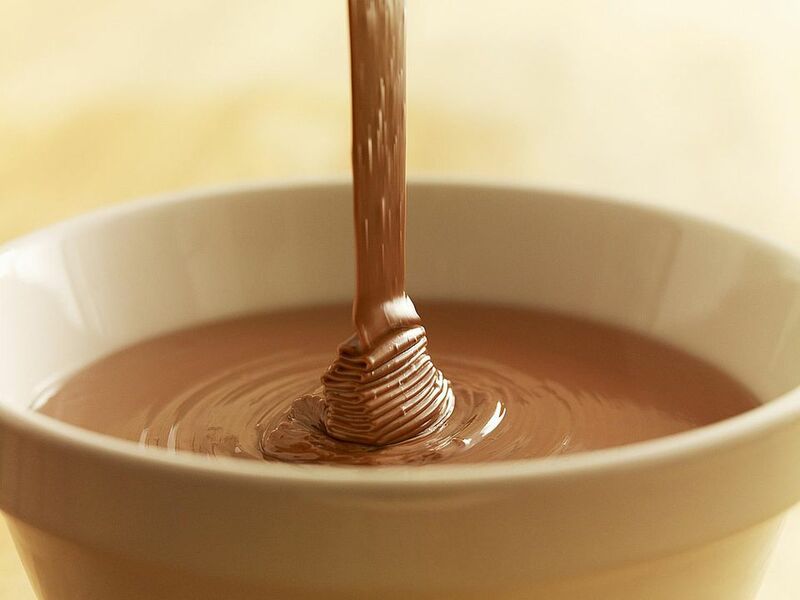 Stir the chocolate only once or twice while melting using a wooden spoon. The instant the chocolate has melted turn off the heat. Never overcook it, or it may go grainy or burn. Break the chocolate into small pieces, place in a microwave-proof bowl. Melt the chocolate in 30-second bursts on medium power. Never be tempted to cook for longer periods as the chocolate melts quickly, and you run the risk of it burning. Burnt chocolate tastes extremely bitter and cannot be used, so always take it slowly. Break the chocolate into small pieces. Place in a warm oven at as low a temperature as you can approximately 225 F/110 C/Gas ¼. Keep an eye on the chocolate and remove as soon as melted. Raising and lowering the temperature of chocolate is a process called Tempering. Tempering is a process used when making decorative chocolate shapes or molded chocolate such as Easter eggs. It gives a sharp, crisp "snap" and a glossy finish to the chocolate. Without tempering, the chocolate will not keep well and can develop a 'bloom' (a white discoloration) which dulls the surface. It is not necessary to temper chocolate when using chocolate in recipes or when adding to cakes or baking. Chocolatiers will use elaborate equipment to temper chocolate at precise temperatures but at home, it isn't necessary to go to such lengths. Simply break the chocolate into small pieces and melt over simmering water as above. Once the chocolate is melted remove from the heat and leave to cool (approximately 30 minutes). Place the bowl back on the heat and reheat gently until the chocolate softens down but not completely melted. It is now ready to use. If the chocolate becomes too thick whilst using, just place it back on the water from time to time but don't overheat. Not 'shocking' the chocolate was the most useful rule we learned when first working with chocolate. Once chocolate is melted it does not like to be shocked by anything very cold. Using a cold, metal spoon to stir, adding very cold flavorings, even a too cold bowl will make the chocolate grainy, and turn instantly into a hard, solid lump. Once the chocolate becomes a hard lump, it can never be undone, not even by melting. Therefore, always use wooden spoons to stir, make sure bowls and other equipment and ingredients are at room temperature and avoid splashing with water at any time.